Scratby Beach01493 846346work BeachScratby Beach near Great Yarmouth is a wide curving, ochre-coloured, quiet sand and shingle beach found at the base of low sand cliffs. A row of large boulders are positioned towards the back of the beach to prevent erosion of the high sand dunes which have virtually become cliffs at this point. Perfect for long walks with the dog or without from autumn to spring or for long lazy days in summer. Walk northwards along the cliff top and enjoy wonderful panoramic views across the sea coming back to the beach via one of the several pathways. 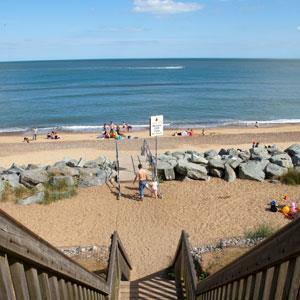 Scratby beach also offers some good surfing opportunities which are better during the winter months and when the wind is in a westerly direction. When surfing conditions are good Scratby beach can attract a substantial crowd. Access to the beach is via slope and steps. Parking is available on cliff top along with public toilets. Scratby Beach near Great Yarmouth is a wide curving, ochre-coloured, quiet sand and shingle beach found at the base of low sand cliffs. When arriving in Great Yarmouth follow the signposts for Caister on Sea. At roundabout take the 2nd exit onto Caister Bypass, signposted Hemsby. At second roundabout take 2nd exit and continue forward onto Scratby Road, turn right onto Beach Road. First Buses run services between Great Yarmouth and Scratby but these can be limited at certain times of year. Please chcek details before travelling.